About The Book On the evening of Nov 26, 2008, four heavily armed terrorists entered the Taj Mumbai and took control of the hotel. All that happened was almost three days of terror and chaos as the great hotel burnt into flames while the world helplessly watched it happen. As an insight into the event, the book tells you the stories of guests, police, staff and the National Security Guard and their Piecing together of transcripts of different calls between the terrorists and their handlers. The Siege: The Attack On Taj takes you straight into the dreaded war zone, telling you what it was like to be inside the Taj on those fateful days. The pages of the book are filled with the heart-breaking stories of staff and guests, of a couple who were about to celebrate their wedding, a British-Cypriot shipping magnate whose state-of-the-art Yacht was docked in front of the hotel and a young Taj employee who survives due to a stranger's phone call. Revelations are made about Headley's double game, training of the terrorists and the shocking incompetence of the Indian Security forces. The beginning of The Siege: The Attack On Taj shows the day to day events occurring in the life of the wealthy and rich people of Mumbai. Just within an hour of the beginning of the party, the terrorists make way into the hotel bypassing the security. They start shooting everywhere and the people hide under dining tables. The book depicts more violence than other books of this genre. The book also tells that the R&AW (Research & Analysis Wing), India's external intelligence agency issued 26 different warnings regarding the terrorist attack. 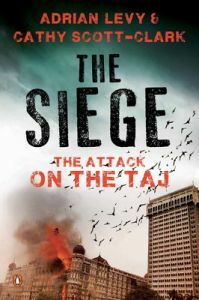 The Siege: The Attack On Taj was published by Penguin Books India in 2013 and can be availed in paperback. About the Author: The authors Cathy Scott-Clark and Adrian Levy have written four books so far. Their most recent work is the acclaimed The Meadow: Kashmiri Kidnapping That Changed The Face of Modern Terrorism. They worked as investigative reporters and foreign correspondents for the Guardian and the Sunday Times for sixteen years. The One World Trust titled them British Journalists of the Year. They also won foreign correspondents of the year 2004. Currently they are busy filming numerous new projects in South Asia.